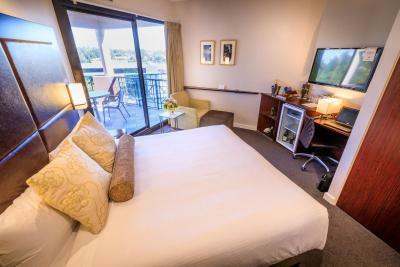 Lock in a great price for Amora Hotel Riverwalk – rated 8.8 by recent guests! In-room movie selections were excellent. The bed was one of the most comfortable we have stayed in and we are looking into purchasing Amora pillows because they were THAT good. Location was perfect. We wanted to stay out of the city but close enough to walk into the CBD or a quick tram ride in. It was very quiet at night. Parking facilities were very secure. Meals from the bar were very nice and breakfast very good. Good location, pleasant staff and free bike rental. The Bed was extremely comfortable and I like that they give you a few options for pillows. Location and layout of the hotel is excellent. I enjoyed the vegetarian meals each night. So clean, comfotable bed nice coffee and tea,excellent overall. 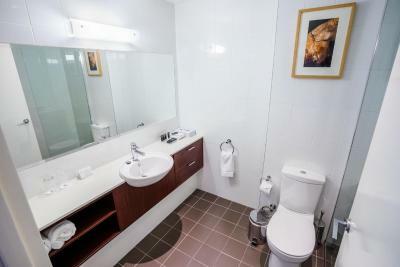 Amora Hotel Riverwalk This rating is a reflection of how the property compares to the industry standard when it comes to price, facilities and services available. It's based on a self-evaluation by the property. Use this rating to help choose your stay! 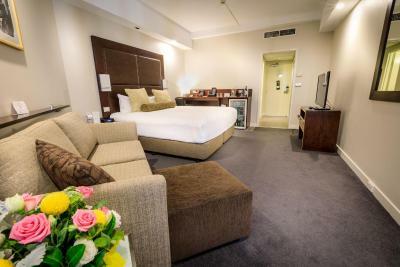 The luxurious Amora Hotel Riverwalk has a tranquil location on the banks of the Yarra River, yet Melbourne's central business district is only 10 minutes away. With deluxe rooms, spa suites and townhouse apartments to choose from, the Amora Hotel Riverwalk offers accommodations to suit every requirement. 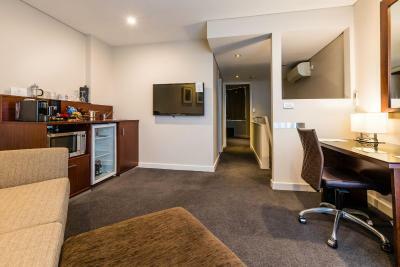 All types are beautifully furnished and overlook the picturesque courtyard and magnificent Yarra River. Fresco Restaurant serves modern Australian cuisine, which you can enjoy indoors or on the grounds courtyard. It is open every day for breakfast, lunch and dinner. 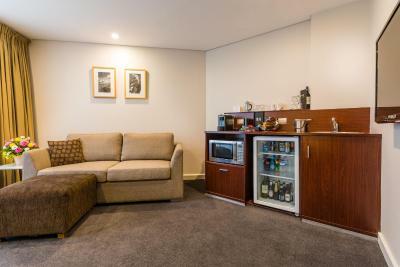 The hotel also has 2 bars where you can sample light snacks, tapas and a wide selection of drinks. 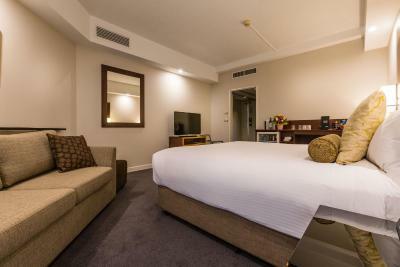 Other attractions such as the Crown Casino, Queen Victoria Market and Melbourne Park are also easily accessible. When would you like to stay at Amora Hotel Riverwalk? Room with fold-out sofa bed and balcony overlooking the courtyard. Please note that the rate based on 2 adults. Maximum occupancy is 3 (see Hotel Policies regarding extra beds fees). 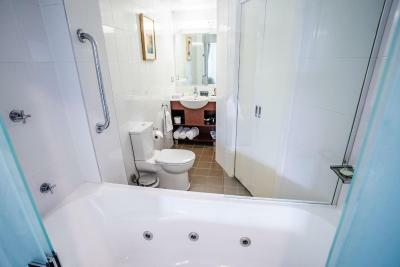 Luxurious suite with spa bathtub, separate living area with fold-out sofa bed and views of the Yarra River. Please note that the rate quoted is for 2 adults. Maximum occupancy is 3 (see Hotel Policies). 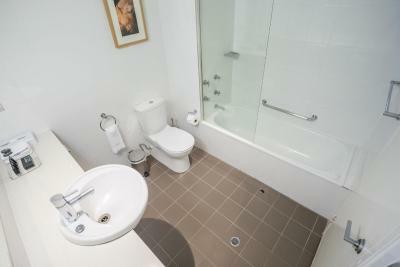 Spacious apartment with 2 bedrooms on 2 levels. Please note that the rate is based on 4 adults. Maximum occupancy is 5 (see Hotel Policies). Please note that the rate based on 2 adults. Maximum occupancy is 3 (see Hotel Policies). This double room features a balcony overlooking the courtyard. It has a cable TV, air conditioning and minibar. This apartment has free sparkling wine and cheese platter, as well as unlimited in-house movies. This double room has a balcony, air conditioning and bathrobe. 2 free bottles of water per stay are supplied. This double room has a cable TV, bathrobe and air conditioning. 2 free bottles of water per stay are supplied. 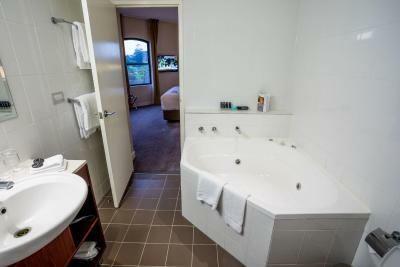 This luxurious suite features a spa tub, views of the Yarra River and a separate living area with a sofa bed. 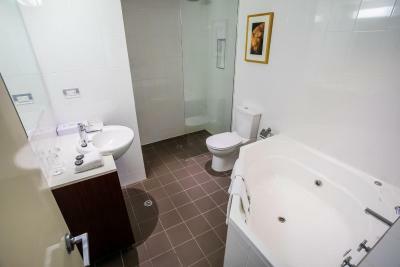 This suite features a balcony, bathrobe and toaster. This twin room has air conditioning, satellite TV and bathrobe. 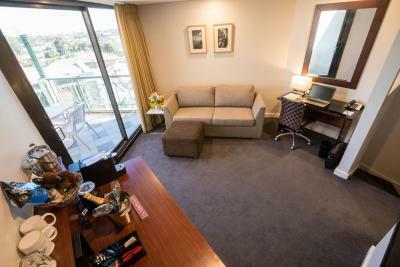 Hotel surroundings – This neighborhood is a great choice for travelers interested in sports, cafes and entertainment – Check location Great location - show map Guests loved walking around the neighborhood! House Rules Amora Hotel Riverwalk takes special requests – add in the next step! Amora Hotel Riverwalk accepts these cards and reserves the right to temporarily hold an amount prior to arrival. Please note that there is a 1.4% surcharge when you pay with a Visa or MasterCard credit card and a 3% surcharge when you pay with an American Express or Diners Club credit card. Please note that events may be held in the property's courtyard and may emit some noise. For further information please contact the property in advance, using the contact details found on the booking confirmation. 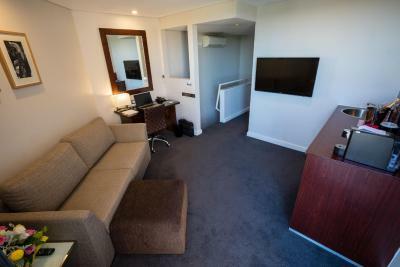 Great location, spacious room, clean, very comfortable & staff where terrific. The hotel music was too loud in the courtyard area. So while we were watching a movie we could here the music outside. The barman Ong was so friendly and attentive. Staff were all really friendly and helpful. Have no complaints have stayed here a few times and always satisfied. I took a room for the openable door to a balcony so I could get some fresh air in my room. Unfortunately I had cigarette smoke wafting into my room most of the time. I booked for a room for 3 & we were put in a room for 2 only. Eventually we were shifted to another room but after a long 5 hour drive we could not just unpack & relax until this was sorted. It was disappointing. Enjoy the dinner in the dining room very much. Friendly staff & great service & very yummy dinner. Especially the Semifreddo dessert. Just delicious. Clean well presented rooms & nice to have a balcony. Building very pretty at night time. What a great property with wonderful staff. we cant wait to go back. Would like more gluten free items. Example gf biscuits with great cheese platter. Gf cake or slice with coffee. The hotel is tired in areas - could use a paint job and general modernization in public spaces and the cleaning wasn’t perfect, carpet in room and tiles in bathroom shower signs of previous guests. Excellent customer service by front desk staff, room was well laid out and to expectation. Great view from our balcony or the Melbourne skyline.